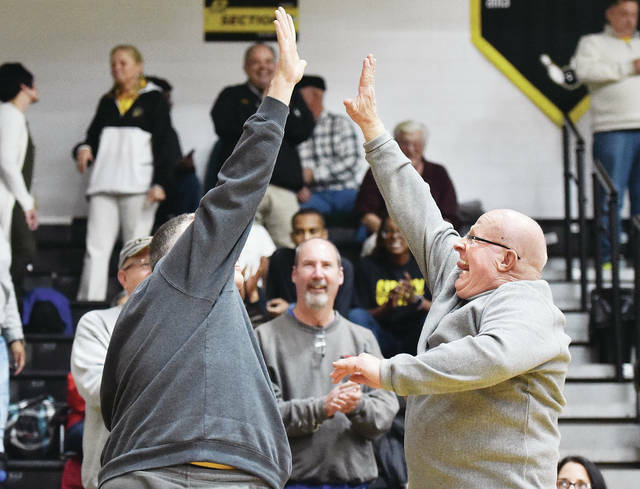 Dave Ross, left, of Fort Loramie, gives Lehman Catholic baseball coach and Sidney Middle School girls basketball coach Dave King a very high five after King was recognized for being inducted into the Ohio Baseball Coaches Association Hall of Fame. King also made three ceremonial basketball shots to earn a donation of $30,000 for a new indoor complex at Sidney High School. King was recognized during halftime of the Sidney and Lehman Catholic boys basketball game at Sidney Monday.